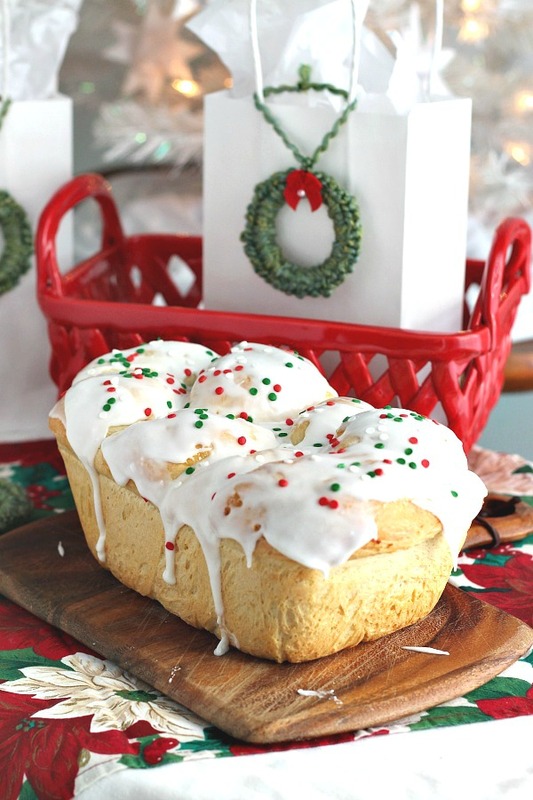 There is something wonderful about baking with yeast. 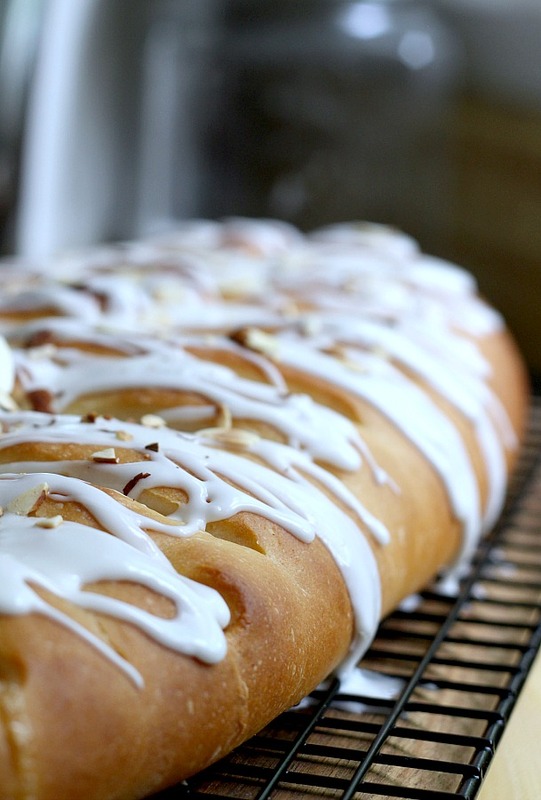 The aroma that fills the house is just a prelude to the soft sweet bread that it produces. 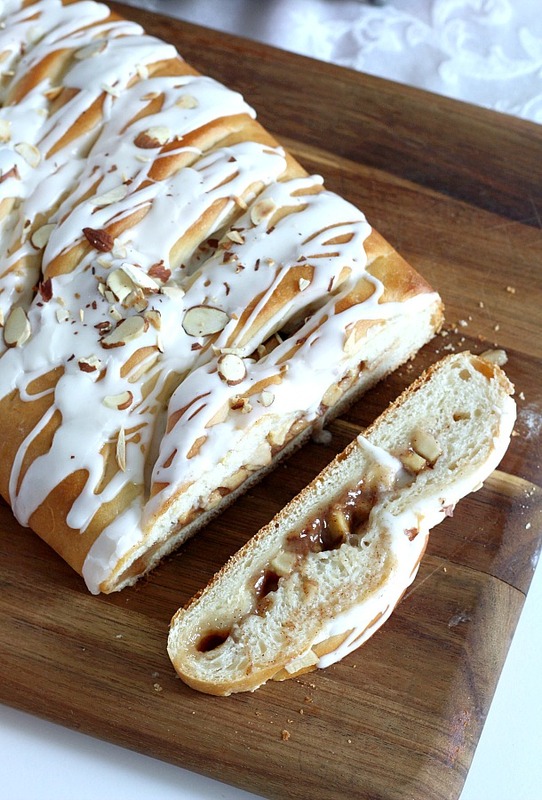 Using a bread machine to make the dough takes all of the work and uncertainty out of preparing this really lovely Frosted Apple Danish Braid. Of course, you can make the dough using a mixer and allowing it to rise in a warm place but it takes just a couple of minutes to add the ingredients to the bread machine. 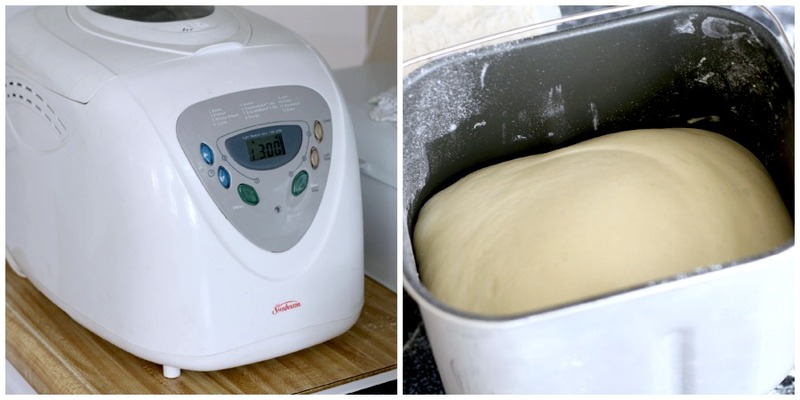 Turn it on and in about 90 minutes, you have a beautiful sweet bread dough. 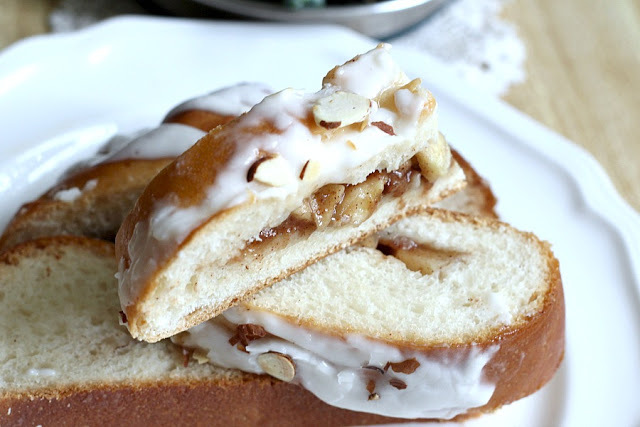 Underneath the frosting and toasted almonds, this apple Danish bread has a filling of sweet cinnamon apples. 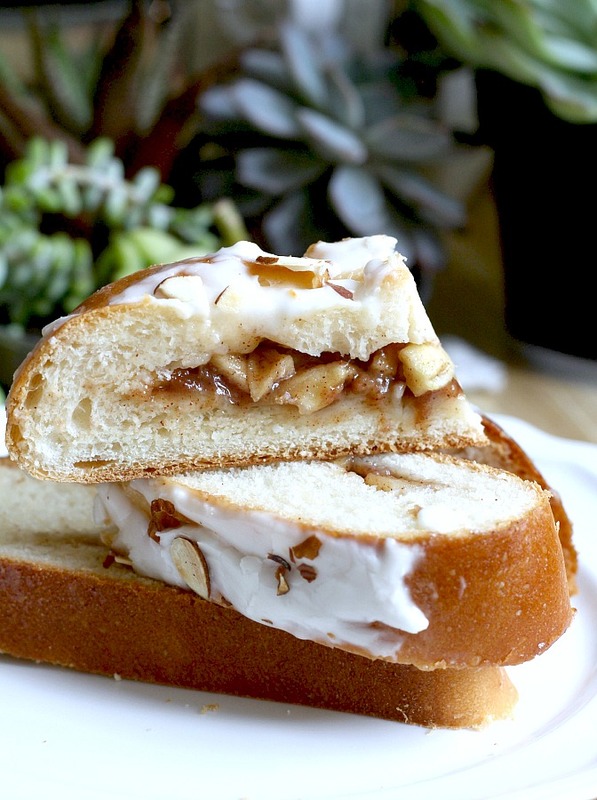 I get 16 slices from this large apple Danish but if you prefer, you can divide the dough in half and make two smaller loaves. 1/4 cup butter at room temp. Place dough ingredients in the bread machine pan in order listed above or according to your bread machine manufactures suggestions. 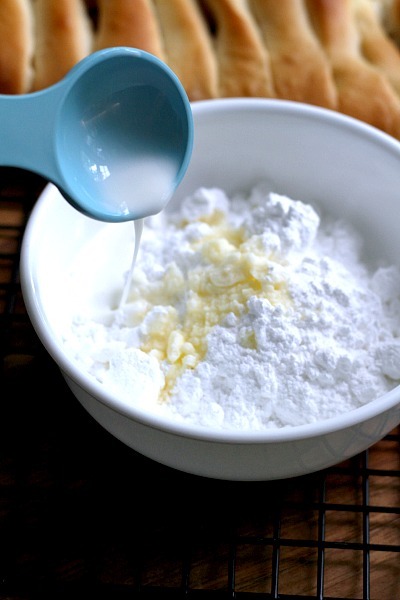 When cycle is completed, remove dough from bread pan onto a lightly floured board. Cover with inverted bowl or towel and allow to rest 5-10 minutes. 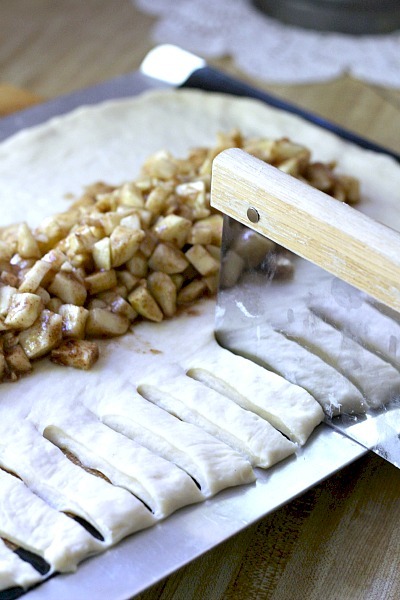 While the dough is resting, prepare the apple filling by tossing the chopped apples and raisins with other filling ingredients; set aside. 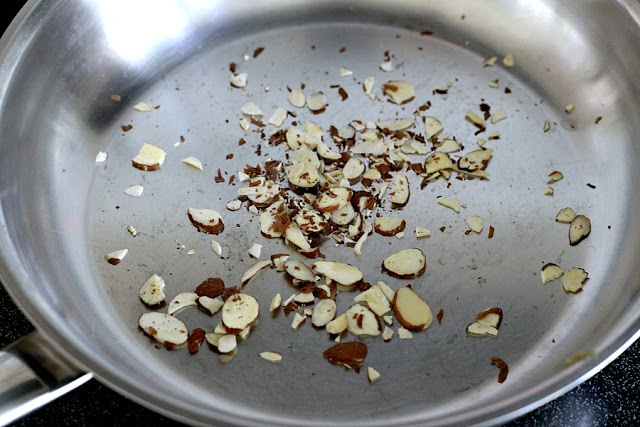 If you prepare the filling too soon, the mixture will get too juicy. 1-2 Tbs Milk or cream, more or less to desired drizzling consistency. 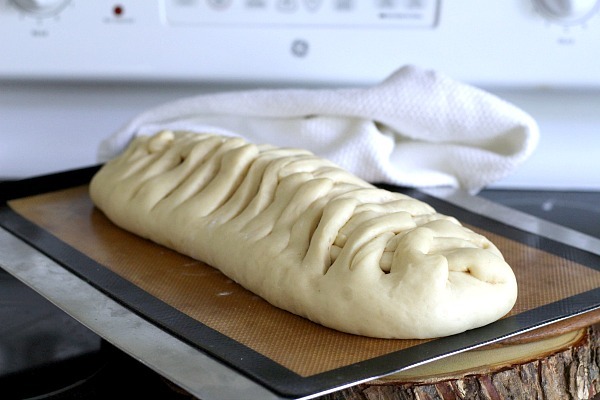 Roll dough into a rectangle about 24-inch x 12-inch. I find it easiest to roll the dough on a baking sheet covered with a silicone mat so I do not have to transfer the bread. My mat measures 11.5 x 16.5-inches which is smaller but works really well. 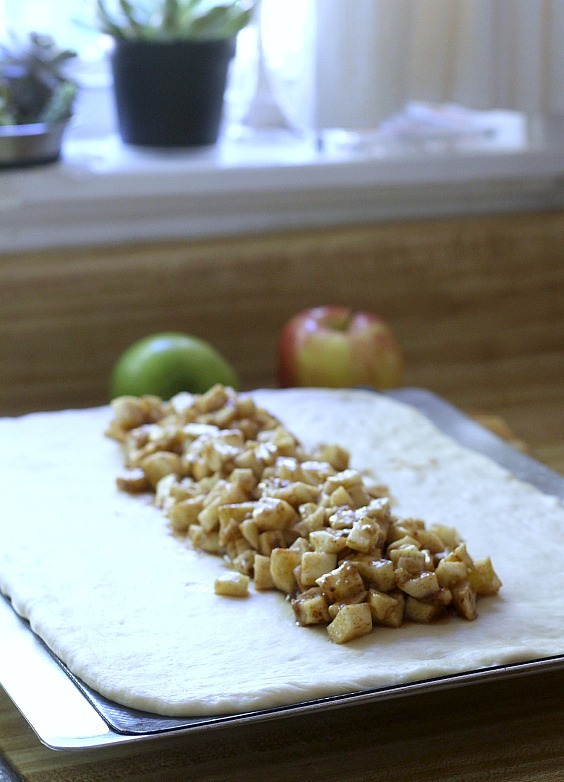 You can roll the dough on a lightly floured surface and carefully transfer to a lightly greased baking pan after filling with the apple mixture and sealing the dough. To do it this way, carefully place two large turners under each end of the filled dough and lift to baking pan. It’s up to you which way you prefer. NOTE: The dough can be divided in half to make 2 loaves, if desired. Spoon filling down center of the dough. 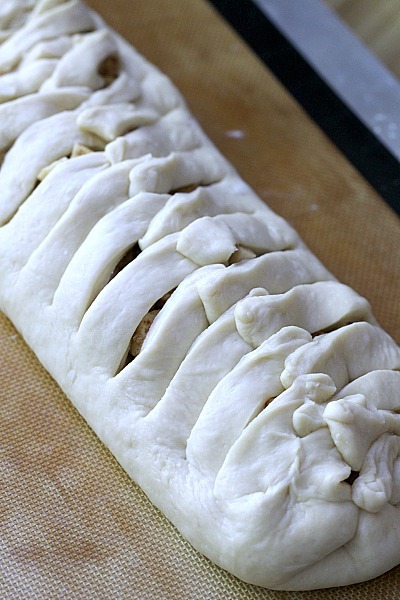 Make evenly spaced cuts along each side of the dough. 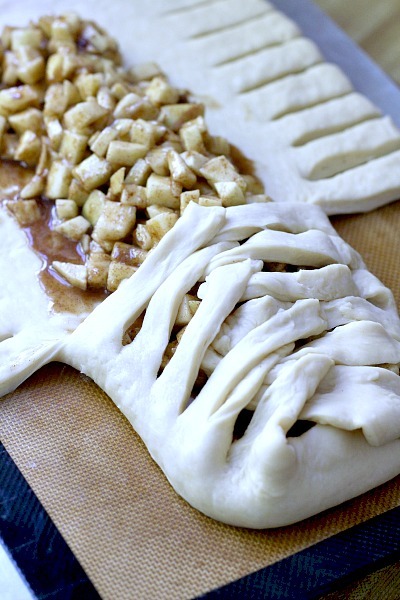 Arrange pieces of dough over filling alternating strips from each side, pinching to keep strips together. Fold and seal ends so juices do not leak out while baking. Cover with a clean towel and allow dough to rise a second time, in a warm place for about 45 minutes or until nearly double. Remove towel and bake for 25-30 minutes until golden brown. (tent with foil if browning too quickly). Here is the loaf after rising and ready to go into the oven to bake. 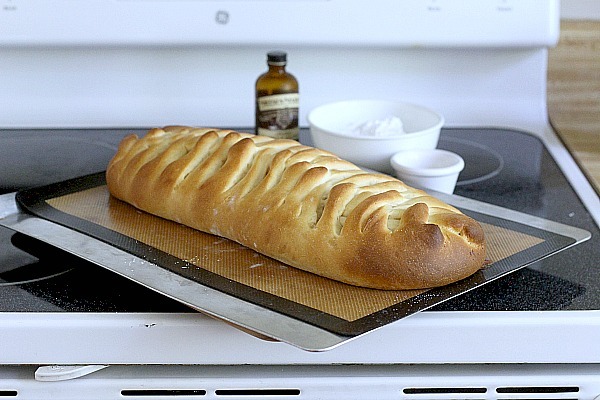 This is how the bread looks just out of the oven! In a small bowl, stir together the glaze ingredients. 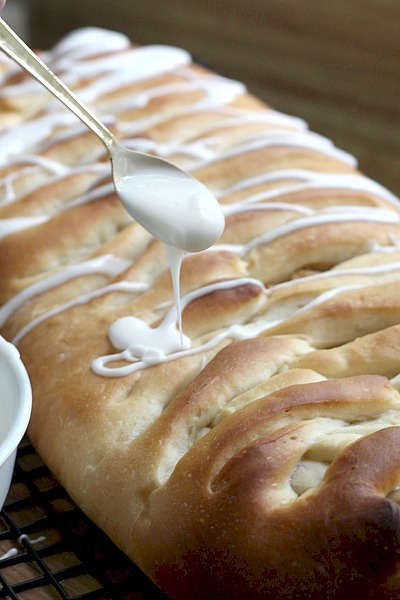 Drizzle frosting on the cooled bread. 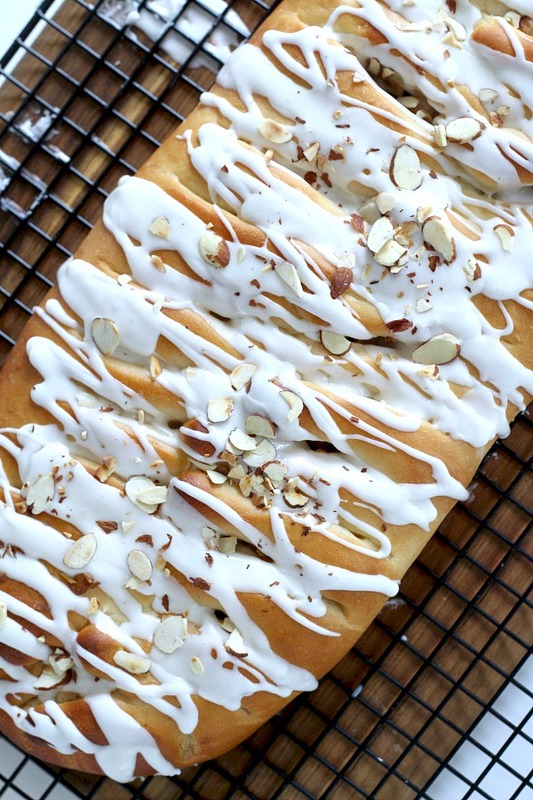 If desired, toast almonds and sprinkle on top of bread after drizzling on the frosting. 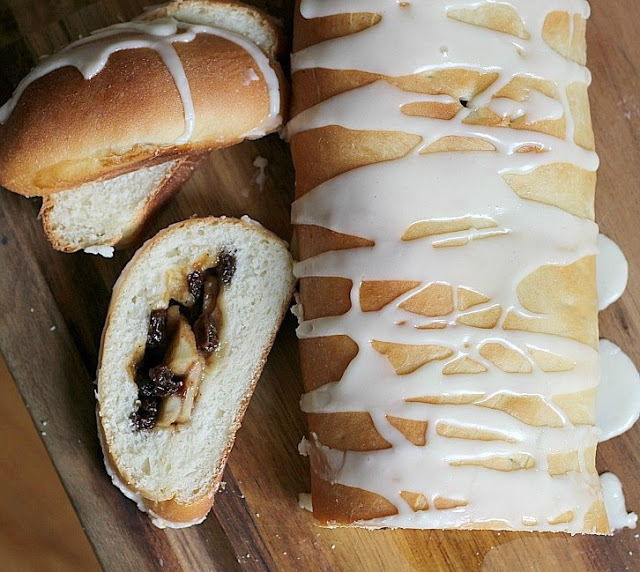 Instead of making a braided loaf, you can make an Apple Danish Bread by folding the sides of dough over the filling, pinch the edges to seal and tuck and pinch the ends under dough so apples and juices are completely sealed in the dough. 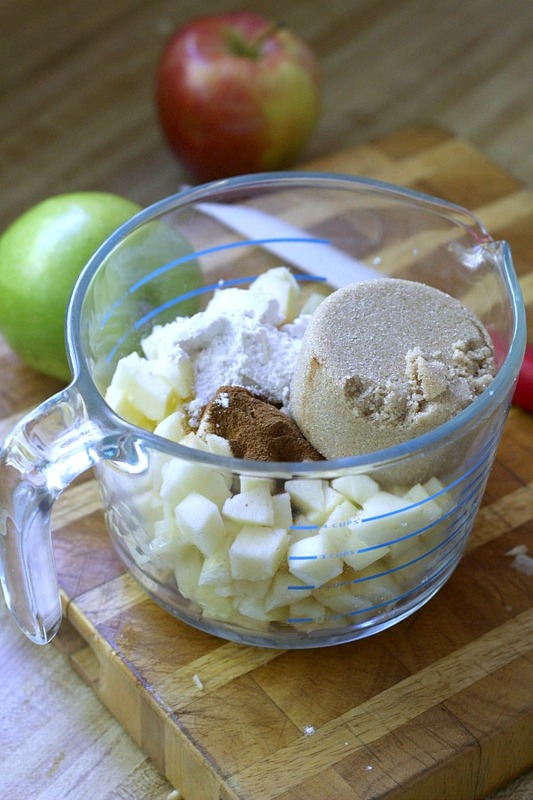 In addition, you can add raisins and nuts to the apple mixture if you like. Wow that looks delicious. I have all the ingredients on hand I might give it a try tomorrow. I can only hope mine mine turns out as pretty as yours.